Hey, anime fans! Here’s a good news for you! GSC Movies and Odex Pte Ltd are proudly presenting an Anime Showcase featuring 3 new animes: Lupin the 3rd vs Detective Conan The Movie, Hunter × Hunter: The Last Mission and Magical Sisters Yoyo & Nene under GSC alternative content umbrella. GSC Mid Valley, GSC Pavilion KL, GSC 1Utama, GSC Paradigm Mall, GSC AEON Bandaraya Melaka, GSC Gurney Plaza, GSC Suria Sabah and GSC CityONE Megamall. 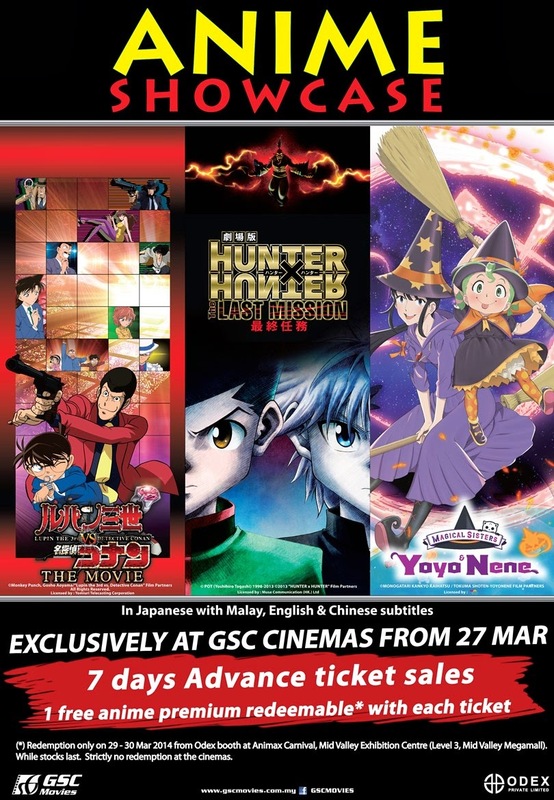 Tickets will go on sale 7 days in advance, iefrom Friday, 21 March onwards via GSC e-Payment on www.gsc.com.my, GSC mobile appsand from the participating cinemas ticketing counter. Each ticket purchased for the Anime Showcase will entitle the holder to redeem one anime merchandise (clear folder, poster, note pads, etc) at the Odex booth at the Animax Carnival held from 29-30 March at Mid Valley Exhibition Centre, Level 3. This offer is valid while stocks last and only available during the Animax Carnival at the Mid Valley Exhibition Centre in Kuala Lumpur only. In a country called Vesparand, a new mineral with super stealth properties has been discovered which attracts Lupin's attention. At the same time the untimely deaths of Queen Sakura and her son, Prince Gill leave Princess Mira next in succession to the throne. During a trip to Japan, Princess Mira finds her double in Ran and takes the opportunity to trade places, which ends with Ran being spirited away to Vesparand with Conan, Zenigata, KogoMouri, Lupin and Fujiko in tow. There they meet a waiting Jigen and solve the mystery of the deaths of the Queen and Prince. Some tens of years ago, chairman of the Hunters Association Isaac Netero sealed away Jed, a man representing the "shadow" of the association that had begun to make use of the power "on." "On," being another side of the coin of "nen," derives its power from the user's pure hatred at the cost of their life. Although he thought he had sealed Jed and "on" away, a team of on-using warriors appears at Heaven's Arena's Battle Olympia Tournament. Gon and Killua, who had come to cheer on Zushi, along with Kurapika, who attends the tournament to protect his boss Neon, are forced to find the source of a violent invasion of the tower and defeat it. However, this may not be so easy, as their foes use the power of hatred as they wish for the death of all Hunters. For more information, please log on to www.gscmovies.com.my.